christmas cookies Archives - Page 3 of 4 - THE OLIVE BLOGGER - Recipes your family will love! Butter Lemon Snow Drop Cookies- A perfect blend of tangy sweetness that compliments any Christmas tray! These Lemon Snow Drop Cookies are guaranteed to melt in your mouth and combine the perfect mix of tangy lemon with sweetness according Meegan from Meegan Makes who was gracious enough to share this delectable cookie recipe with us for our 13 Day Christmas Baking Frenzy! These are a nice and easy cookie, with basic ingredients that you likely already have on hand, so you can whip them up anytime you are in the mood! I think they will be the perfect addition to our goodie trays this year, and a nice compliment to all the chocolaty goodness that normally fills our tummies! These Lemon Snow Drop Cookies are guaranteed to melt in your mouth and combine the perfect mix of tangy lemon with sweetness!! Follow along for all 13 days of Christmas Baking! Find the cooking instructions linked below! full cooking instructions at meegan makes: click here! This Amaretti Cookie recipe is a very special one for me, especially this year…you see, my mother in law (who was Italian) passed away last month from a brain tumor after a very long battle, and this cookie was one she used to make for every special event and holiday. I still remember when she gave me the recipe, “Meli, one day you will want these recipes, you know to make the cookies like how I make” and boy was she ever right! These Amaretti Cookies are so easy to make, they make a ton (8 dozen!) they are full of almond flavor and they go perfectly with a cup of tea or coffee! 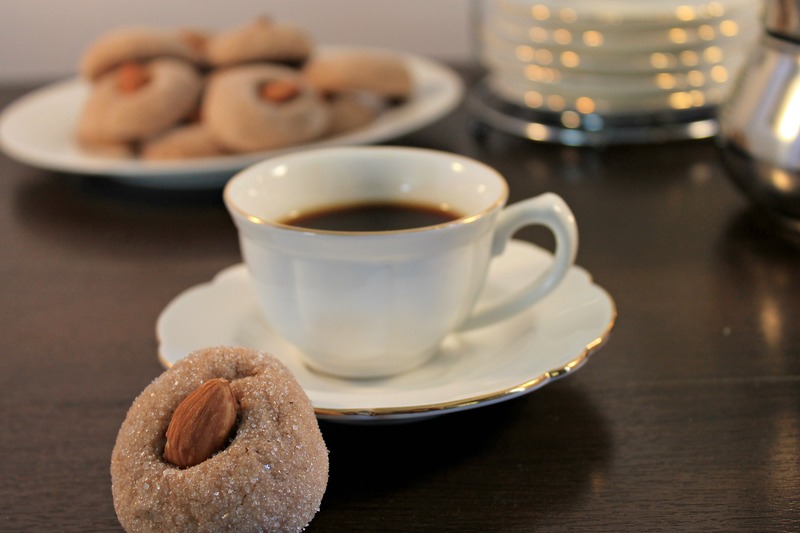 A Classic Italian Amaretti Cookie- a tasty almond cookie with the right amount of sweetness, makes 8 dozen cookies! They are a wonderful cookie for freezing, and with the amount that they make you can bet you will always have some on hand for your holiday guests. Now, we made them in 1/2″ balls but next time I would go a little smaller, a little bit more bite sized is what I was going for! Aren’t they beautiful?! I love the almond on top, the crunch adds a nice surprise when you are eating the cookie, and if you are wanting to make them a little more festive you can always roll them in a colored sugar rather than white granulated sugar. These Amaretti Cookies are so easy to make, they make a ton (8 dozen!) they are full of almond flavor and they go perfectly with a cup of tea or coffee! In stand mixer beat together eggs and sugar until blended. Add in oil, lemon (zest of full lemon as well as juice) and extract, mix well. In small bowl sift together your cocoa and baking powder, add to wet ingredients and mix until just combined. Dough will be very wet, you want to add your flour in 1c at a time and mix. Your dough should come together after the 4th cup, then you add by 1/4c increments until the dough is "workable" (you need to be able to roll with your hands into little balls). You will need approx 5c of flour, but may need slightly more or less depending on your wet measures. Pour 1c sugar into small bowl. Roll dough into balls (aprox 1/2") and roll into sugar. Place cookies on silicone mat or parchment paper and gently press an almond into the tops...the cookie will push down into a disc shape. Bake for 11-13 minutes (you want them slightly golden around the edge, this ensures you have a nice crunchy outside and soft inside!). Be sure to check out the other yummy treats in our Christmas Baking Frenzy (13 Days in total)!! In fact, why don’t you BOOKMARK that page now, as we do a new Christmas Frenzy every year with yummy treats to be shared around the Holidays! Looking for even more cookies like our amaretti cookies? 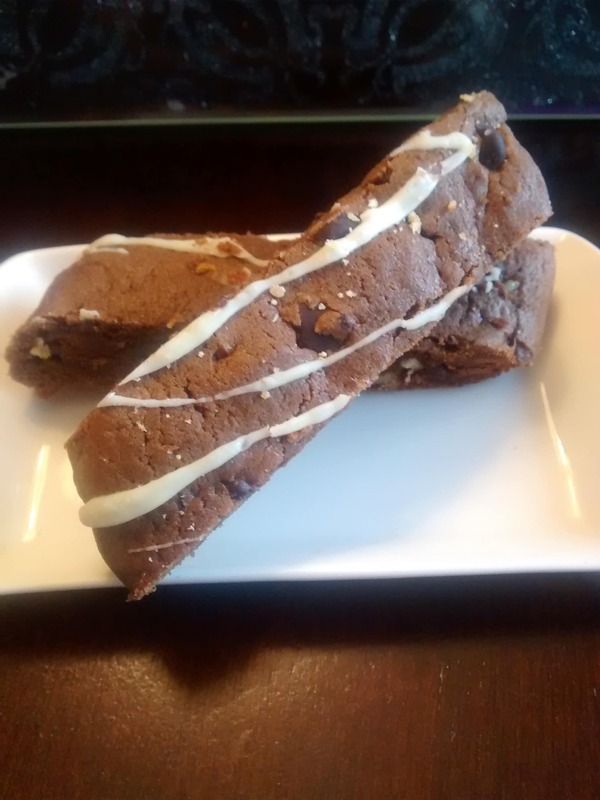 Brownie Biscotti – a rich and delicious chocolaty cookie, perfect for dipping in coffee! Classic Whipped Shortbread Cookie – everyone NEEDS this recipe in their cookie box, the perfect gifting cookie! 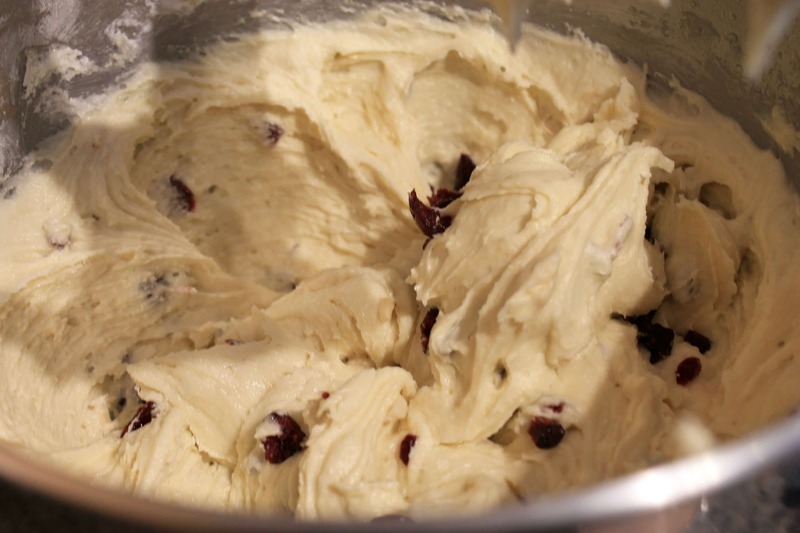 This White Chocolate Cranberry Biscotti cookie recipe is full of so much goodness! 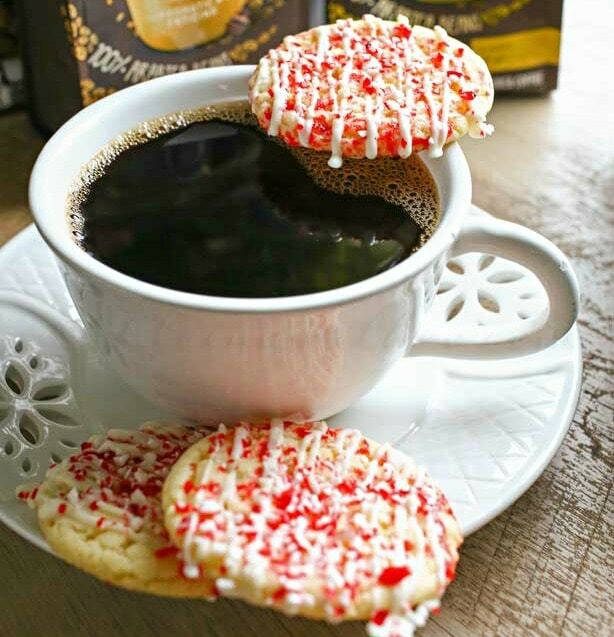 It is perfect with a cup of coffee, or as a late night snack…the flavors combine everything we love about the Holidays, and hope you enjoy too! This is one of our FAVORITE cookies to make at Christmas time!!! It takes a little bit more time than most of our other cookies, but trust me they are more than worth it! These Biscotti are loaded with cranberries and almonds, with a hint of white chocolate and even orange juice (Mmm, I know right?!). 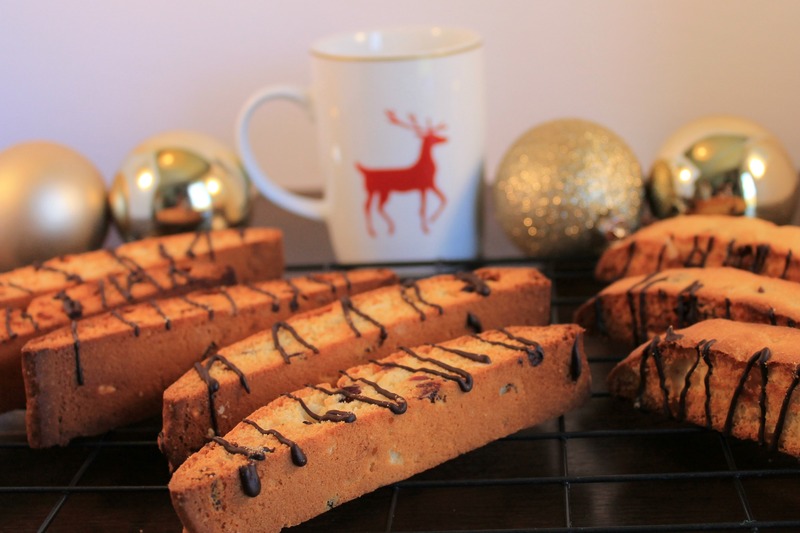 Now, like the rest of our Christmas Baking Frenzy cookies, these Biscotti are perfect for adding to a goodie tray for a friend or neighbor, and are even gorgeous on their own in a simple mug as a teachers gift! (Or you could save them all for yourself…we won’t tell!). Be sure to make a double batch, these freeze great and will hold up to 3 months (in a sealed airtight container )! In stand mixer beat butter and sugar until light and fluffy. In a small bowl sift together flour, baking powder and salt, add to wet mixture and mix well. Add orange juice and extract, beating until well combined. Stir in chopped almonds and cranberries. Once cooled you can drizzle with semi-sweet or white chocolate! 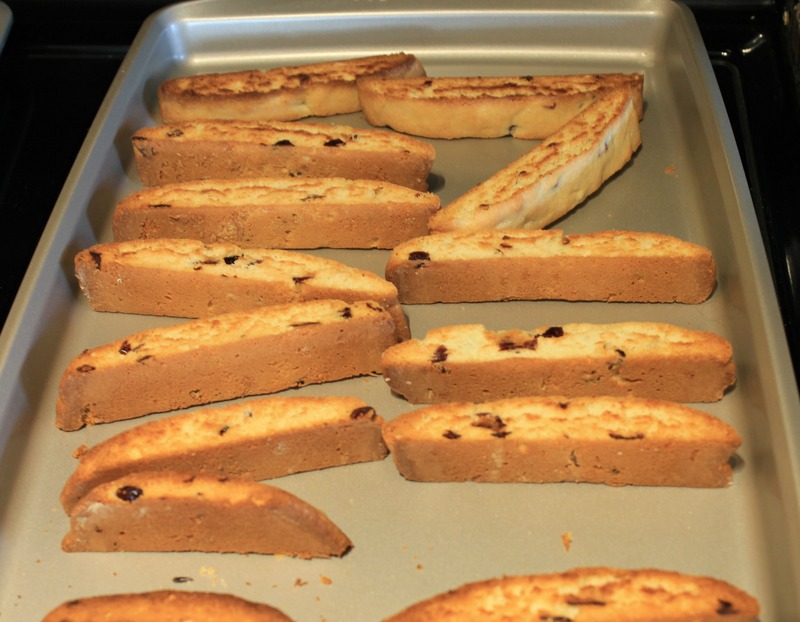 Here are some photos showing the progression of the delicious Biscotti! 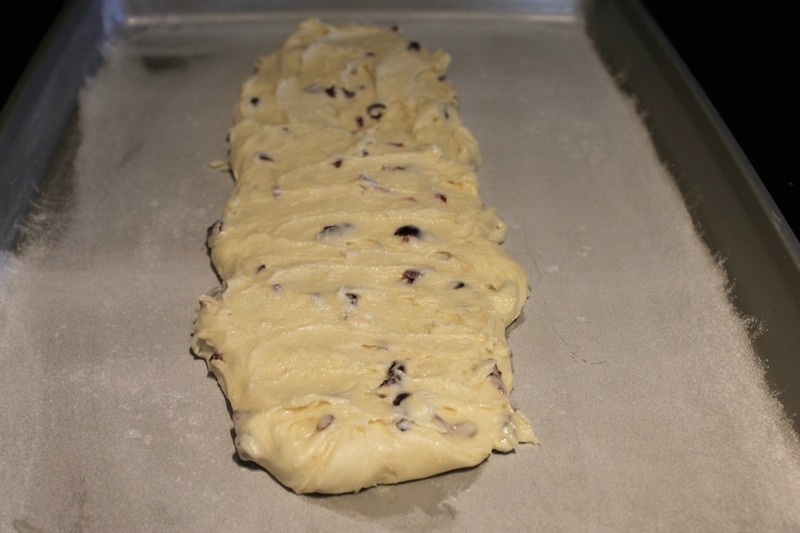 Spread your batter into a “log” shape on your cookie sheet. They are ready when they get a nice golden brown! You want to ensure they look like this before flipping to go back into the oven for the final cook. This page contains affiliate links, which help to keep the site running 🙂 Please see my Disclosure Page for more information!